Chicken Steaks recipe by Maryam Burki at DesiRecipes.com. 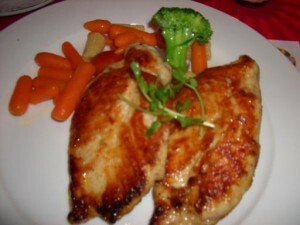 Marinate the chicken with soya sauce, vinegar , honey /sugar, salt , peppers and mustard powder for 1 or 2 hrs. Then take a frying pan keep it on heat till hot and add the chicken in it keep turning it till light brown in colour. Now turn up the heat really high and add oil in it pour the water on it this will flame the pan and give a barbequed taste to the chicken . Serve hot with stir fried vegetables and mashed/baked potatoes.